Now available in our NEW SATIN BLACK ANODIZED FINISH!! These clean looking, compact ISR master cylinders are available both left side and right side with a choice of 14mm or 17.5mm bores.The 14 mm M/C is suitable for any single caliper installation or a dual caliper set up using two piston calipers with up to 34 mm diameter pistons and most hydraulic clutch covers who’s maker recommend the use of a 9/16″-5/8″ bore Master Cylinder. The 17.5 mm M/C should be used for all applications requiring more volume like when using a pair of four or six piston calipers or high volume hydraulic clutch covers who’s maker recommends the use of an 11/16″ or larger bore Master Cylinder. 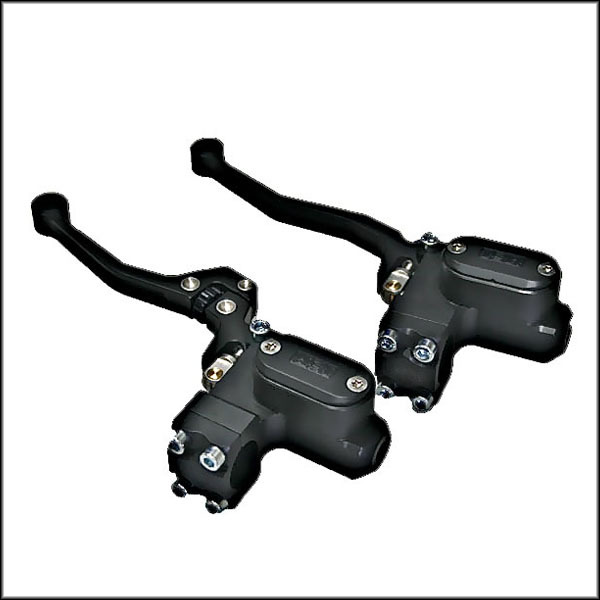 They fit 1″ handlebars and are equipped with leverage adjustment to control the feel of the M/C and can be fitted with optional adjustable levers as shown.All ISR master cylinders use only DOT 4 brake fluid. Accepts 10 x 1.25 mm Banjo Bolt (not included). Add our Specially Priced Banjo Bolt Kit (includes 1 ISR Stainless Steel 10×1.25mm Banjo Bolt and 2 10mm Sealing Washers) now and save the extra cost of shipping.